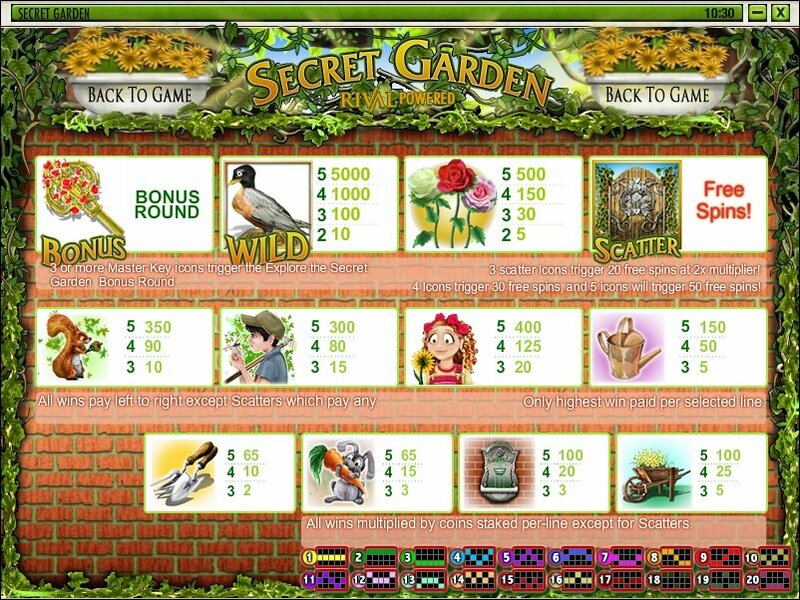 Overview: Secret Garden is a 5 reel, 20 payline, 10 coin Slot game. Secret Garden has one wild icon, 2 scatter icons and 1 bonus round. The Garden Gate Icon is a Scatter Icon. If 3 or more of these icons appear on the Reels you will receive 20,30,or 50 free spins. The free spins will be worth the same value per spin as the original spin that triggered the free spins. Any wins received during these free spins will payout at 2X the payout listed on the paytable! The Master Key Icon is a scatter icon which will trigger the Secret Garden bonus round. If 3 of these icons appear on the reels you will be sent to the Secret Garden Bonus Round. These symbols do not need to appear in a sequence to trigger the bonus round as well you do not need to be playing all Paylines. It can be anywhere on any of the five reels. Note: You may wager 1 line up to 20 lines. Simply click on the Select Lines button to enable multiple paylines. You will only be paid on winning combinations for enabled paylines, except for the Scatter Icon(s). Try this game for yourself at one of the recommended sites listed below! Online Play: This slot machine is featured at online casinos that run Rival Gaming software. You can try it risk-free by utilizing the free, no-deposit welcome bonuses that are offered at many Rival Gaming sites; if you decide to play for real, then be sure to play at a Rival Gaming casino that offers an initial deposit bonus of at least 100%. 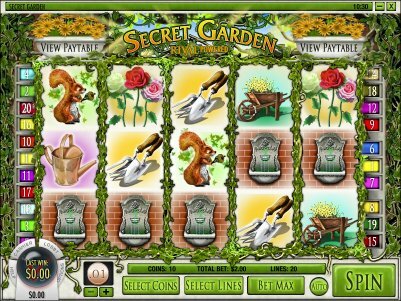 Similar Slots: If you like Secret Garden, you might like these other Rival video slot machines: Arabian Tales, Cream of the Crop, Gushers Gold, Jacques Pot, Reel of Fortune, Roll out the Barrels. Disclaimer: The information present on this web site is intended for entertainment purposes only. Please check your local, state and provincial laws before you gamble online. If your local laws prohibit online gambling then we recommend you consider an alternative form of entertainment.